Boil the pasta for around 15 minutes. Drain, rinse in cold water and set aside until the minced meat is prepared. Place the oil, minced meat, salt, pepper, cinnamon and nutmeg in a pot. Sautι for 15 minutes and then add the tomato juice and leave to simmer for half an hour. During this time prepare the Jotis Bιchamel sauce in line with the instructions on the packet. Add 3 lightly beaten eggs if desired and stir in. Add 1/3 of the bιchamel sauce and the cheese to the minced meat and stir in. Oil a medium sized casserole dish and place half the pasta in a flat layer. 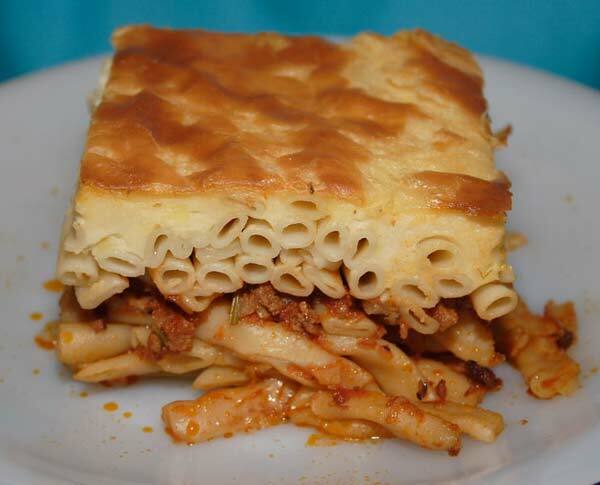 Place the minced meat on top and cover with the remaining pasta.Cover the entire surface of the pastichio with the remaining bιchamel sauce and sprinkle with some melted butter. Sprinkle with some grated gruyere too if desired. Roast at 180oC in a fan-assisted oven for approximately 1 hour. In a medium heavy saucepan, melt butter over low heat. When butter starts to foam, add the flour all at once, mixing well with a wooden spoon. Cook over low heat 3 to 4 minutes, stirring constantly to incorporate and cook flour. Remove pan from heat and let stand, up to 15 minutes. Meanwhile, in a medium saucepan, scald milk (heating it until just below boiling point). Return saucepan with roux to medium-low heat. Add all of the scalded milk at once (to avoid the formation of lumps). Simmer, stirring gently with a wire whisk or wooden spoon. Add studded onion, bay leaf and thyme sprig. Cook, stirring, over low heat, 15 to 20 minutes, until smooth and thickened. Strain sauce through fine-mesh strainer. Add salt, white pepper and nutmeg to taste. Makes about 2 cups.